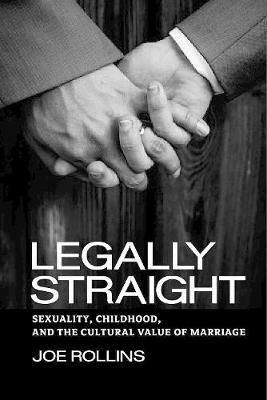 Argues that cultural conceptions of children - and childhood - played a key role in legalizing gay marriage Legally Straight offers a critical reading of the legal debates over lesbian and gay marriage in the United States. The book draws on key judicial opinions to trace how our understanding of heterosexuality and marriage has changed. Upon closer inspection, it seemed that the cultural value of marriage was becoming tarnished and the trouble appeared to center on one very specific issue: reproduction. As opponents of lesbian and gay marriage emphasized the link between marriage and accidental pregnancy, the evidence mounted, the arguments proliferated, and resistance began to turn against itself. Heterosexuality, it seemed for a moment, was little more than a set of palliative prescriptions for the worst of human behavior, and children became the victims. It thus became the province of the courts to reinforce the cultural value of marriage by resisting what came to be known as the "procreation argument," the assertion that marriage exists primarily to regulate the unruly aspects of heterosexual reproduction. Cultural conceptions of children and childhood were being put at risk as gays and lesbians were denied marriage, so that writing lesbian and gay families into the marriage law became the better option.